In the Episode 1 of the o Déjà vu series to explain how I see those scents that I feature in the series I cited Daphne du Maurier‘s book The Scapegoat. The plot concerns an Englishman who meets his double, a French aristocrat, while visiting France, and is forced into changing places with him… Today’s episode calls for another literature reference but I’ll get to it later. Half a year ago, soon after I introduced my lemmings for the upcoming release of Annick Goutal Nuit Etoilee in one of the Weekly round-up episodes, I was contacted by a person from Beauté Prestige International’s PR department. She asked for my address to send me press information and a sample. It was my first ever contact from PR people and it was about the perfume I was so anxious to try. Probably you can imagine my feelings. But being paranoid as I am, before responding I checked the name and the e-mail address. Everything was legit so I replied and started waiting… Well, the sample has never arrived but at least I felt thrilled for a while. A month later Natalie (Another Perfume Blog) brought a small vial of Nuit Etoilee to our perfume sniffing rendezvous. I applied it to my wrist, inhaled – and immediately thought that it reminded me of another perfume that I already had in my collection. As soon as I bought Nuit Etoilee I contacted my blogo-friends who previously helped me with similar projects and asked them to participate in another blind testing. They agreed and I sent them two color-coded spray vials – green and blue. The main question I asked was: Do you think these perfumes smell similar? I have an input from three bloggers so I recruited Rusty to help with visuals (click to enlarge). To start off, and hopefully this doesn’t matter, but I feel pretty sure I know both of these. I believe the blue one is Nuit Etoilee. It has that kind’ve minty orange feeling at first, and then it is sappy and piney and quickly dries down to a certain ingredient that I smell in a lot of things and cannot figure out what it is. I think I’ve mentioned it to you before. It smells to me like hot dry cleaned clothes. Whatever it is, this ingredient is very prominent in the blue one and in Chanel Jersey. Wearing the blue one side by side with the green one makes me smell something in the blue one that I don’t think I would have otherwise (and if blue is Nuit Etoilee, I never smelled this before in it), and that is tobacco. I feel like I sense some tobacco in the blue one when I wear it next to the green one. The green one, though, to me is very much tobacco (and the blue one isn’t). And the green is very chewy and dense and sweet, with a thicker sweetness than the blue one. I think they have something else in common as well for a little while. I don’t know what it is. The closest I can come to an association is very weird: maple and raisins. People sometimes speak about berry as a component of tobacco, and maybe this is what they are talking about. I don’t know. Then, it goes away and they are very different again. Overall, they smell somewhat similar to me, but less so than Gold and Climat (the reference is to the Episode 2 – Undina). The answer to your question is yes, I do think that right at the beginning they have a similar green-galbanum-carnation-peppery thing that could be considered similar. The stuff in the green vial is so MUCH MORE than the stuff in the blue vial that even that first shot of peppery green is a lot more three-dimensional, to my nose, than the blue vial; but there is a similarity, enough that I would believe some of the same ingredients were used to get the effect, though the blue vial develops so much more simply and sheerly and the green vial develops immediately into the “swamp accord” that makes me think it must be Amouage Honour Woman or something in that line. The blue vial turns into a VERY powdery iris, which for some reason reminds me of Prada Infusion d’Iris but I think must be Iris Silver Mist or another one of those very classic irises that I have smelled but do not wear and do not like. IT’S A LOT OF IRIS. The green vial has more of a general floral quality to it (which is why I think it might be Honour rather than Interlude Woman) and at the far drydown, where the blue vial is just trying to hit me over the head with powdery iris and makes me want to walk away, the green vial has settled into more of a clean woody base and what might very well be a bit of iris might be what is filling in the background of the wood and giving it that “clean” touch without there being a musk or something similar (I don’t think the clean note is musk but would be willing to hear that I am wrong). I think that it’s iris because it has something of the feel of Chanel No. 19 about the cleanness – it’s not a modern laundry clean, more of a soft/crisp vegetal clean that I associate with iris. For the record, I don’t think these scents smell at all alike, but these two structural elements – the opening green, and the iris – seem to make them something like third cousins once removed, or something. 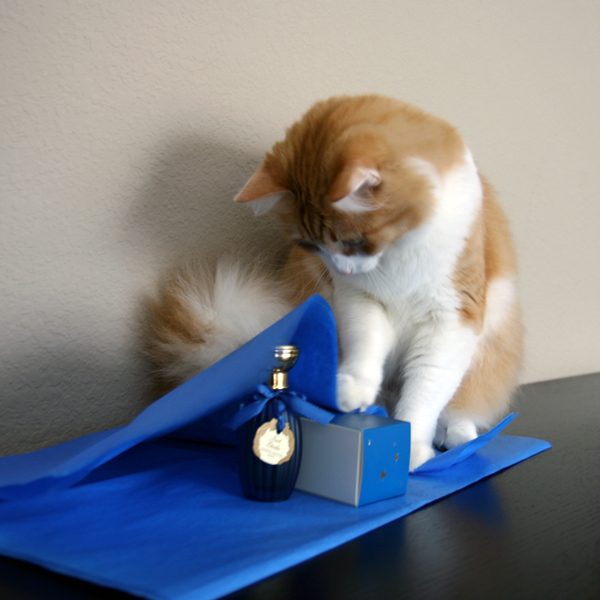 The fragrance in the blue vial has pretty much thrown me for a loop. It smells so familiar, as if its name ought to be on the tip of my tongue, yet I can’t figure it out. To my nose, this is a very light and airy fragrance that smells of tea, citrus, hay-like greens, spice that leans heavily on anise (with hints of other spices I’ll mention in a minute) and lots of clean white musk. It reminds me of Cartier L’Heure Fougueuse in some ways, but I know it’s not that one, as it lacks leather and is sweeter than L’Heure Fogueuse. I thought in some ways it resembled Annick Goutal Mandragore, but Mandragore is deeper. The blue vial fragrance also strikes me as cologne-like, and I find some resemblance to the samples you once sent me from Atelier — Trefle Pur and Bois Blonds — as it has elements of both of those in it. In the end, I can’t identify it and I can’t detect much in the way of resemblance (or smell-alike notes) with the green vial fragrance, except for this: mid-way through its development, it has a similar smell in terms of spice notes: in both fragrances, I get hints of anise, wormwood/absinthe (which is obvously not a spice, but I’m lumping it here anyway), ginger, bay leaf, and a faint trace of lavender. I find the anise and absinthe smell — a very green-like spicy smell — the thing that seems most common to both fragrances (in the green and blue vials). Natalie was right: the blue vial contained Nuit Etoilee – created in 2012 by Isabelle Doyen, notes include citron, sweet orange, peppermint, Siberian pine (balsam fir and everlasting absolutes) and angelica seeds. And Suzanne was right: in the green vial it was Fille en Aiguilles – created in 2009 by Christopher Sheldrake, notes include Pine needles, vetiver, sugary sap, laurel, fir balsam, frankincense, candied fruit and spice. And all three contributors did not think these two perfumes had too much in common. As I said in the beginning, the situation reminds me of a fiction book. Despair. It’s a novel by Vladimir Nabokov. Hermann Karlovich, a Russian émigré businessman, meets a tramp in the city of Prague, whom he believes to be his exact double. […] After some time, Hermann shares with Felix a plan for both of them to profit off their shared likeness by having Felix briefly pretend to be Hermann. After that, though, Despair unwinds differently from The Scapegoat. After Felix is disguised as Hermann, Hermann kills Felix in order to collect the insurance money […]. But as it turns out, there is no resemblance whatsoever between the two men, the murder is not ‘perfect’, and the murderer is about to be captured by the police […]. If you keep reading Wikipedia article you’ll see from where I’ve got the idea of the title though I do not think they are correct: even though Nabokov is known for his love for playing with words in multiple languages, the novel was written in Russian and the English word used by him later in translation is just that – a translation the original title. By now I wore both perfumes many times. I know that they aren’t identical. 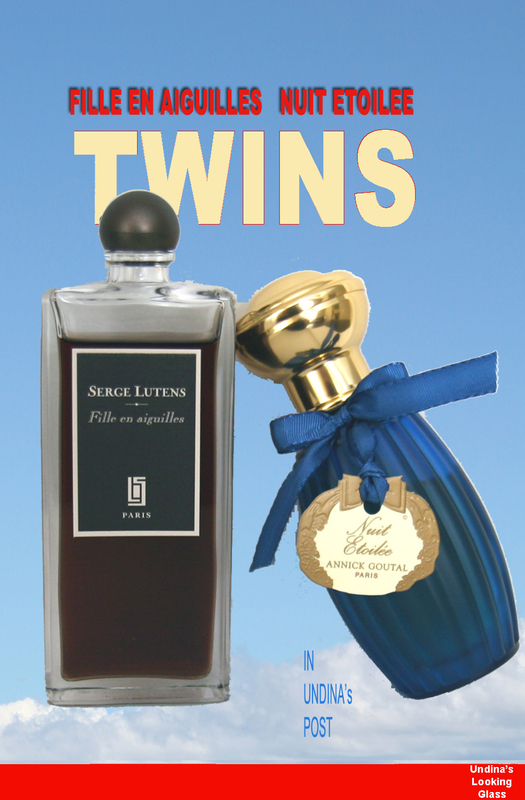 Perfumes I covered before in this series were much closer to each other than Nuit Etoilee and Fille en Aiguilles. I can tell one from the other and won’t mix them. I do not think owning both is redundant (did you see that beautiful blue bottle?!) But again and again when I test them in parallel I can’t help but thinking how much they have in common for my nose: they both smell of pine and fir – the scent I was looking for last year’s holiday season. This year I have two perfect perfumes for the upcoming season. I’m prepared. 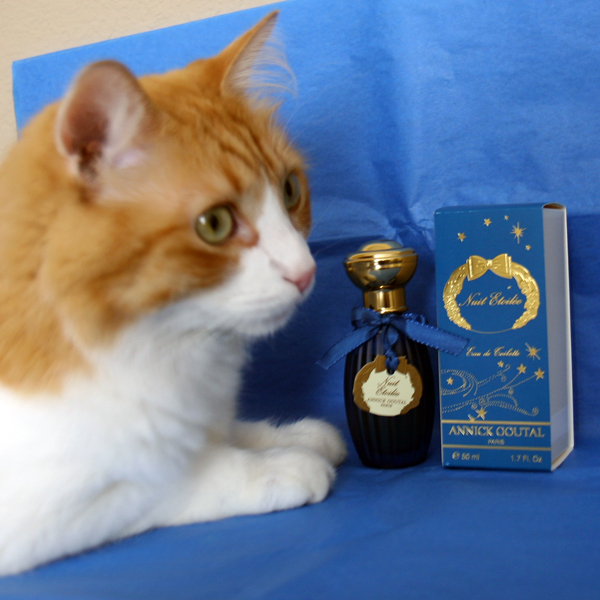 This entry was posted in "Four legs good", Acquaintance with letters, Déjà vu, Favorite Perfumes and tagged Annick Goutal, Christopher Sheldrake, Daphne du Maurier, Despair, Fille en Aiguilles, Isabelle Doyen, Nuit Etoilee, Serge Lutens, The Scapegoat, Vladimir Nabokov. Bookmark the permalink. I very much enjoyed another fun episode of the Déjà vu series, Undina. Everyone’s impressions were so insightful. I haven’t tried either of them but feel I know them both a lot better now. Fille en Aiguilles sounds more appealing to me but you’re right about that Goutal bottle! Have you seen the bottle for the up and coming L’Heure de Nuit by Guerlain on FB? Gorgeous. Suzanne, thank you again for doing that! I was very impressed by your thinking that the blue one smelled cologne-like and even had another Annick Goutal in mind. These are great. You girls all know your stuff too which makes it extra interesting. I loved reading everybody’s thoughts. Every time I’m impressed by what people can smell without any other clues. Literary references alongside wonderful perfume comparisons – divine! Thoroughly enjoying your blog and this series. Undina, I so enjoyed reading this and – for once- wished I would have been blind sniffing those, since I know both well. It would have been so much fun to see if I had recognized them. However, I agree with Suzanne. I find Nuit Etoilee airy, perhaps even a bit thin, compared to FeA, which is an incense fragrance I love. I see where you come from comparing the two, but to me these are very different. Sometimes, for me, a sentiment can make two fragrances similar, although others might not agree. I usually recognize perfumes that I know well but if it’s something that I’ve just tried passingly it’ll drive me crazy until I can figure out what it was. I am in awe of everyone’s noses, I am. Kudos to all of you. And now I obviously need to try both Nuit Etoilee and Fille de Aiguilles. Dionne, you should definitely try Fille en Aiguilles: it’s your type of a perfume. You still might not like it but at least it should play friendly on your skin. 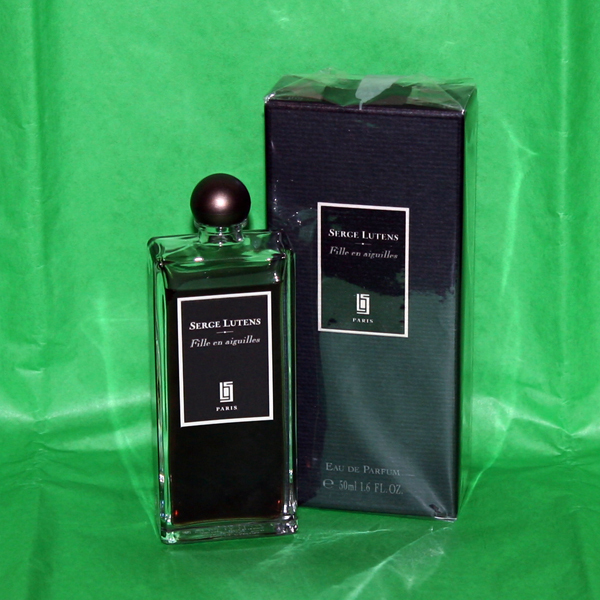 I didn’t try that Serge Lutens but I’m a happy owner of Nuit Etoilee which I really adore. I remembered that. Do you have a square bottle or the same as on my pictures? I love this series! Haven’t smelled either of these perfumes but they both sound interesting. I haven’t tested very many perfumes with a prominent pine note, only one or two. Last year I was craving a pine scent. I went as far as wearing Jo Malone’s room spray Pine & Eucalyptus! I’m glad I found these two for this year. What great noses you have! And what a great sniffing event, Undina. Inspired by your post, I’m wearing them side-by-side ( knowing full well which is which, of course), and find that the juxtaposition really brings out the citrus notes of Nuits, and the evergreen notes of Aiguilles. But I see exactly why you see them as cousins Undina. I would reach for them on the same day, for the same mood (though Nuits étoilées is a bit more summery on me–more refreshing). I tend to think of perfumes as being in mood families, rather than their assigned marketing categories or perfume families (chypre, oriental, etc.). This usually have more to do with me than the perfumes, and its rarely about notes–not more than a few. In any case, these scent harmonies sometimes take me by surprise. Is that how you feel about your fragrance duos? My most recent mood pairing: Ambre des Merveilles and Veneta Bottega. I agree that NE is a more summery perfume but they are for the same mood, you’re right. I’m not familiar with Ambre des Merveilles enough to think of your paring but I’ll try it again soon and see how it feels. Wonderful post, Undina. I have an FB of Nuit Etoilee and it is indeed wonderful. I am looking forward to using it more in the rotation once the weather gets colder; it is still flaky weather here — the plants and animals are very confused. Interesingly enough, I got a decant of L’AP Iris Pallida and I could have sworn that it is almost a twin of Nuit Etoille minus the lemony-minty top note! I should still have a couple of sprays left in my Iris Pallida sample so I should definitely try it now, when I know NE – thanks for the idea! I am curious to know your impression once you have a sniff of Iris Pallida again. This week, I tried the EDT and EDP versions of Diptyque Volutes and I love them both; however, both of these remind me of Spicebomb so much so that I’m wondering if I should bother with the Volutes although knowing me, I’ll probably end up with at least one of them! Thanks Undina for this wonderful post! I do have a full bottle of FEA but not ET. With two spritz of FEA on one hand, I quickly made my way out to the Annick Goutal counter in the city to conduct my own experiment. It’s amazing how pine can be re-interpreted so differently. FEA on me is all about the rounded typical Serge Lutens fruity rum cocktail mixed in with pine firs and creamy woods. ET on the other hand on me is a much “fresher” interpretation – lighter, with the impression of fir with peppermint, before a sour skank note appears. Unfortunately, this sour note sustains on my skin. Still, it was so interesting reading about the blind sniff comparison on your post! It seems so obvious to me which scent is which but I really do wonder how I will fare if I were given two completely unmarked samples. As I said, these two aren’t real twins but there is something in them that makes me put them into the same category. In blind testing everything smells slightly different and unless you recognize a perfume beyond any doubt you start doubting yourself. This is great Undina – and so insightful. I haven’t had the luck of trying any of these 2 perfumes – but it sounds great. As I’ve mentioned in the beginning of the series, there isn’t much practical usefulness of these findings. But it’s fun. Well it could be practical if you found two that smelled a lot a like but were miles apart in cost. This is a really great post. It’s so interesting to see what other people smell in perfumes. It’s also interesting to see how what they smell compares to the notes in the scent. I often wonder with some perfumes if I’d really be smelling a certain note if no one told me it was in there. Yeah, wouldn’t it be great to find a less expensive alternative? ;) But no, usually it’s something expensive vs. discontinued or from the same price brackets. Absolutely fascinating! Now I want to sniff them side by side! I also found it so interesting to read different reactions to the same two samples. My mind works this way: whenever I smell something that reminds me of another scent I can’t let it go until I investigate and decide for myself if I imagined that resemblance or if it’s actually there. I’m not looking for those “twins” on purpose but whenever I find next I’ll organize the next blind testing. Vis a vis your last comment: it seems clear to me that when I am smelling, I am most closely associating what I am smelling to what I’ve most recently smelled. I most recently put a lot of effort into comparing the Interludes, as you know; so that Filles came along, my brain really slid them right alongside each other, and while I could tell that this wasn’t what I had just smelled I filed it into a similar category. Now I really have to re-visit Honour. Also as I told you, I’m just not good at identifying perfumes!, because I do have Nuit Étoilée and never once thought of associating it with either of these. My explanation for that is that when I wear NE, I do wear it on skin; and I didn’t like either one of these samples on my skin, as we discussed, so I really compared them on paper. The day after you posted this I went back and tried my own NE on the same type of paper, and it truly did not dry down to as heavily representative of the “iris” note (whatever that dusty earth floral is that I’m smelling) as the sample you sent, and that was very interesting to me too. Your vial was definitely different from my decant!, like an EDP to an EDT; but they only sell the Annick Goutals in one concentration, don’t they? Also, I need to read more about Fille en Aiguilles! Thank you so much for letting me participate in your sniffing project! Actually, NE comes in both EdT and EdP. Mine is EdT. Do you know what concentration is your decant? 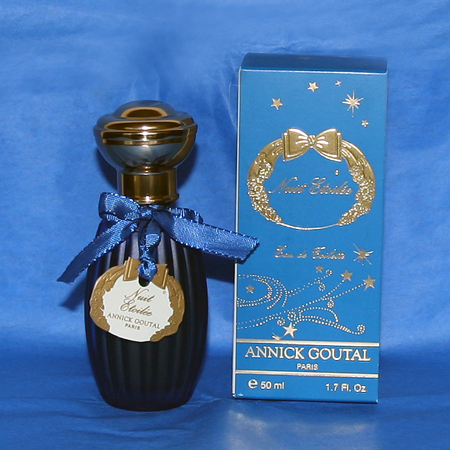 Many Annick Goutal’s perfumes have that dusty component. I’m not sure I can smell it in this perfume but I think I know what you meant. These are fun and fascinating! Natalie and Suzanne are spot on with the raisins in FeA — I love how pine absolute smells like raisins. (And I’ve been lemming a bottle of that forever … never tried Nuit Etoillee though). Now I want raisings :) And yes, I’m impressed every time with what others can smell during those blind tests! Is there Saks close to where you live? It’s the only store (as far as I know) that carries Nuit Etoilee). I haven’t seen it there (at leasr in SF one) but you might be right. There’s a Neimans here but no Saks or Barneys — I’ll have to look for it next time I’m in Boston. I’m glad you also like Nuit Etoilee. I plan to enjoy it this holiday season.